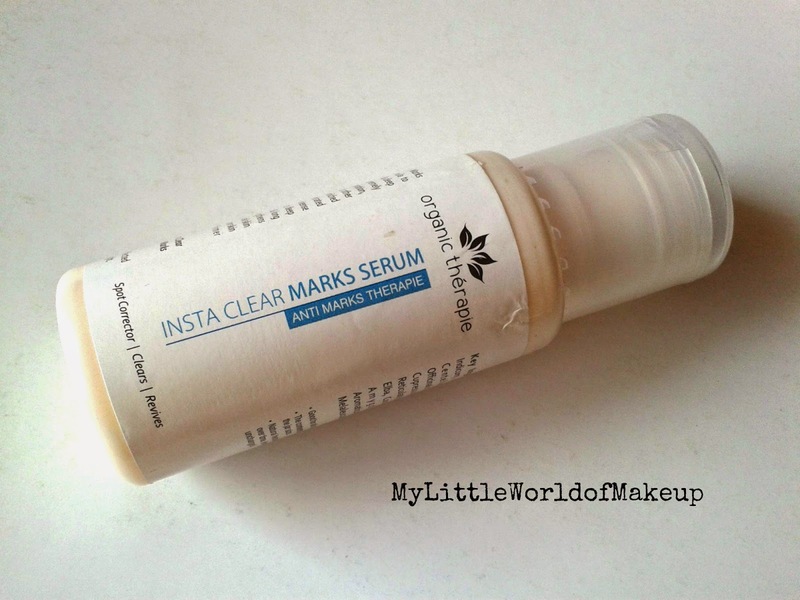 Organic Therapie Insta Clear Marks Serum Review By Natasha – Organic Thérapie Inc. I hope you all are doing well. It is mid week and just a day more for Friday.. Yayy!! Today I shall be talking about a product which worked well for me. 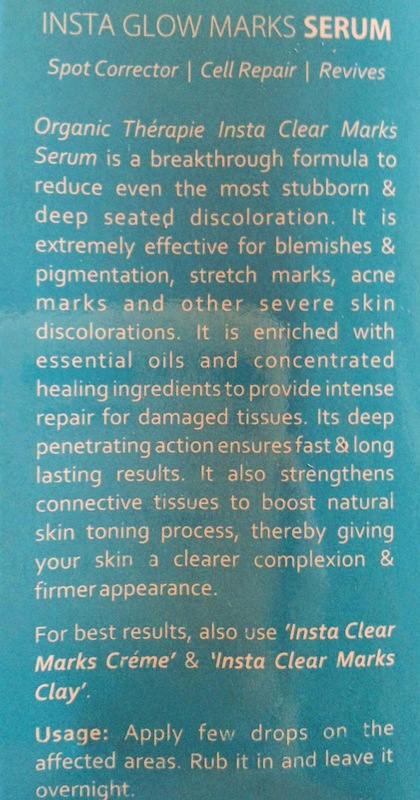 I am talking about Organic Therapie's Insta Clear Marks Serum which is a product sold at the Sattvik website whose products like Eye cream & Face Serum have been reviewed on my blog.Acne & Face scars is one of the most common problem faced today especially by those who are suffering from Acne & pigmentation on the face like me. Let us find out more about this serum in my review today. Organic Therapie Insta Clear Marks Serum is a breakthrough formula to reduce even the most stubborn & deep seated discoloration. 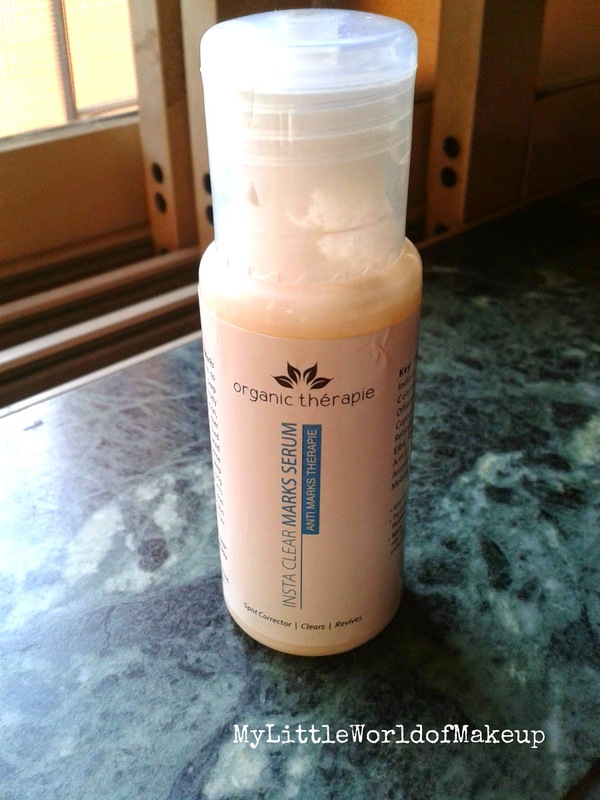 It is extremely effective for blemishes & pigmentation, stretch marks, acne marks and other severe skin discolorations. It is enriched with essential oils and concentrated nourishing ingredients to provide intense repair for damaged tissues. Its deep penetrating action ensures the fast & long lasting results. It also strengthens connective tissues to boost natural skin toning process, thereby giving your skin a clearer complexion & firmer appearance. For best results, also use 'Insta Clear Marks Creme' & 'Insta Clear Marks Clay'. Spot Corrector Clears Revives. The serum comes in a semi transparent bottle with a flip cap which opens & shuts well. It has a small outlet & lets the appropriate amount for use. It does not leak which is yayy as I had a problem with the previous one. It is travel friendly in my opinion. The serum is stark white in color and light weight in texture. It does not feel oily. The serum is not too thick nor too thin and once applied gets absorbed easily into the skin. It smells citrus and nice and would suit even those with most sensitive noses. Now recently I had 2 big zits under my nose and they made me feel sick as I rarely get them on my face. I did suspect dandruff to be the main reason behind it because I had been suffering from severe dandruff then. Now as per the golden rule I did not pop it and let it dry but the mark it left annoyed me. I received this serum in time & was more than happy to test it out. Also I was worried about the pigmentation around my mouth which I happily say has reduced quite a lot and so has the pimple mark lightened than before. I generally use it before bed around the mouth, that way it lasts and is more effective for a longer time. I really like this serum, one of the best I have used for this price. Formula is perfect not too thick nor thin. Apt for skin pigmentation/discoloration & acne marks. Decent & travel friendly packaging. Apt for all skin types & age groups. Since it is herbal results will take time. Available only in select stores. 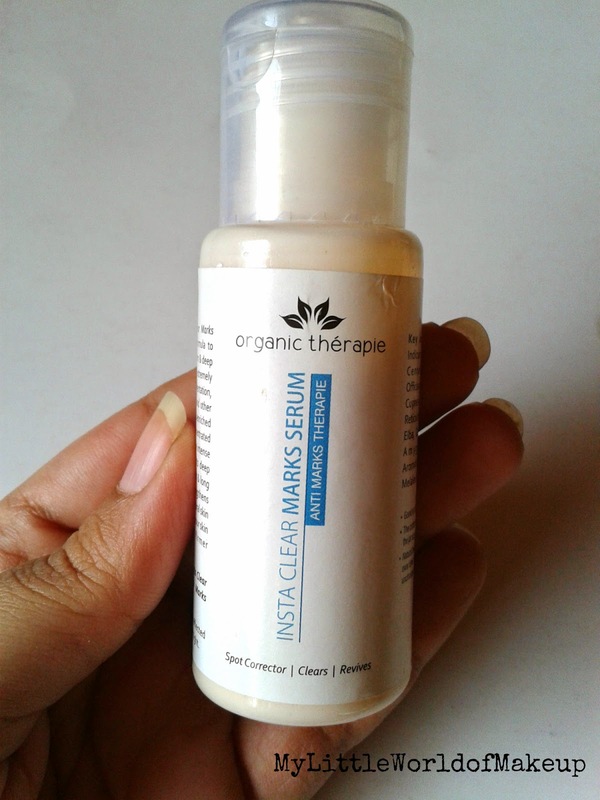 Organic Therapie Insta Clear Marks Serum is a perfect & light weight serum which is effective in fading marks, pigmentation & discoloration on the face. The results take time but it would definitely work. 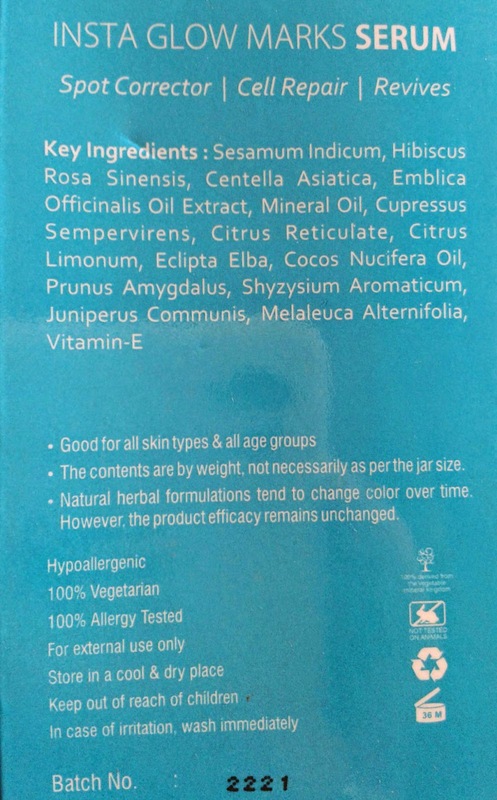 I like that it is chemical free which makes it safe to use by people of all skin types & groups. Hence I recommend everyone to try it. I hope this review was useful to everyone reading. Please feel free to comment below as it makes my day. Also new visitors may leave their blog links for me to check out.